I'm assuming the serial numbers on the labels are also encoded on the actual enclosed batteries. In other words, DJI is running a tight ship. I'm not going to activate any of them until a) my replacement aircraft arrives (it went out to nearby Cerritos by FEDEX earlier today) and b) I've ascertained that it will actually launch with both my android and my iOS devices. 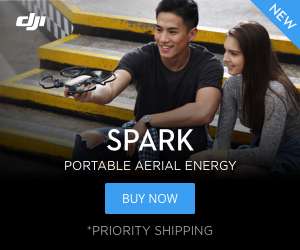 If it doesn't launch, then it and all the batteries are all going back to DJI via Amazon. Suggestion: always buy your products via Amazon, even if they are shipped directly from the seller rather than "fulfilled by Amazon." Later, if you have a problem with the order, always contact the seller via your Amazon account, so that Amazon is aware of the problem. In my experience, when vendors are aware that Amazon is involved, they are always going to do the right thing --- and pronto, too. My first Tello was flying rather well with the virtual joysticks on my LG V10 (android) -- at least as good as with a $100 GameVice GV140 controller -- until I had a crash outdoors when the wind swept it into some bushes on the perimeter of the parking lot in which I was flying. The bushes got an unscheduled trim, but the only damage I could see on the aircraft was a missing propeller, which I replaced with one of the spares. Nevertheless, it would no longer fly. When I tried to recalibrate the IMU, I could not get it to complete all six steps. So I ordered a second one. When the new one -- which I purchased from DJI via Amazon -- would not fly out of the box, DJI sent me a pre-paid FEDEX label to use to send it back to them in nearby Cerritos (CA) for repair/replacement, which I did yesterday the 30th. They said it may take up to two weeks to verify the defect, but the fine print next to the RA # on the label said it was being returned for replacement, so I suspect I will receive a replacement much sooner. Does the Steel Series game controller attach to your iOS device via Blue Tooth or by lightning cable? If by lightning cable and it also works with the iPad Mini 4, please reply with the specific model #. Thanks in advance. Do you have the problem with skipped frames that others have noted? See my new post "It's a Miracle" -- did you have something to do with making that miracle happen? How’s your video feed? Do you get a considerable amount of frame skipping or video lag?